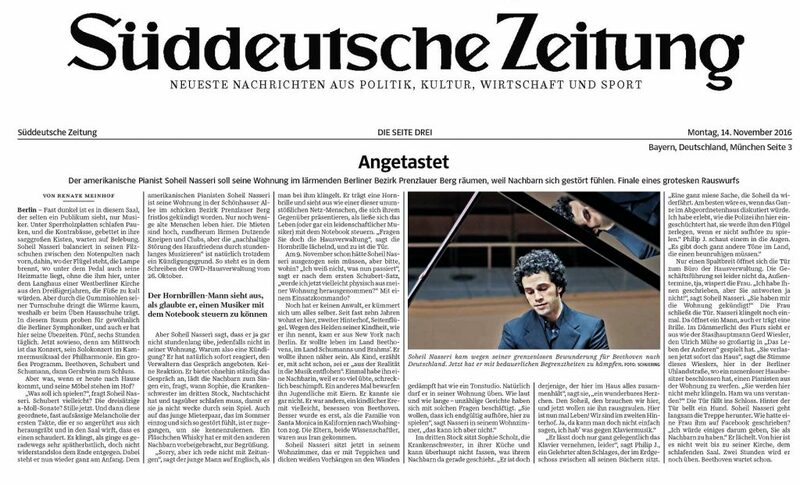 Subtitle: American pianist Soheil Nasseri must vacate his apartment in the noisy Berlin neighborhood ‘Prenzlauer Berg’, as neighbors feel disturbed. Finale of a grotesque eviction. Photo caption: Soheil Nasseri came to Germany because of his boundless admiration for Beethoven. Now he has to fight against regrettable limitations. Caption two: The horn-rimmed glasses man looks like he thinks he can control a musician with a laptop. It’s almost dark in this hall. Audience members rarely see it – only musicians. Timpani sleep under plywood boards and the contrabasses– bedded in their coffin-sized cases– wait to be brought to life. Soheil Nasseri, in his felt shoes, balances his way forward through the music stands towards the piano, where a lamp shines. Under the pedals is his heated mat, without which his feet would be cold, here under the nave of a 1930s West Berlin church. The warmth can’t penetrate through the rubber soles of his tennis shoes so to practice he wears slippers. In this room the Berliner Symphoniker rehearses and he gets his practice times as well. Five, six hours a day. Today most definitely, because on Wednesday is the concert- his solo concert in the Berliner Philharmonie. A big program. Beethoven, Schubert, Schumann, then Gershwin at the end. But what if he comes home and his furniture is on the sidewalk? “What should I play?” asks Soheil Nasseri. “Schubert perhaps? The three-movement A-minor Sonata?” Silence now. Then the well-ordered, almost rebellious melancholy of the first measures that he so movingly digs out of himself and throws into the hall, so that one shudders. It sounds like late-autumn, as if life is moving – though not without resistance – towards the end. And then all is as it was before. The American pianist Soheil Nasseri must vacate his apartment on Schönhauser Allee in the chic Berlin neighborhood Prenzlauer Berg. Here there aren’t many older people left. Rents are high, there are dozens of noisy bars and clubs in every direction, yet nevertheless “sustained disturbance of the peace via hours-long music-making” is of course still a reason for eviction. That is what it says in the letter dated October 26 from GWD Property Management. But Soheil Nasseri says that he doesn’t play hours-long at all, at least not in his apartment. So why the eviction notice? Of course he reacted immediately and offered to discuss the matter with the landlords. No response. He always makes contact with his neighbors, invites them to sing-a-longs, asks the nurse Sophie- on the fourth floor- when she has the night shift and has to sleep during the day, so that he won’t wake her up by playing piano. And he went to visit his new neighbors, the ones that moved in this summer and are so disturbed by the piano, to get to know them. He brought a bottle of Scotch, together with the other neighbors, to welcome them. “Sorry, but I don’t talk to newspapers,” said the young man in English when a journalist rang his doorbell. He wears horn-rimmed glasses and looks like one of those unshakable internet people who present themselves to those around them as if they could control lives (or even a passionate musician) with a laptop. “Ask the landlord,” says the horn-rimmed glasses man smiling, and he shuts the door. On November 9 Soheil Nasseri should have moved out. But sorry- where to? “I don’t know what will happen now,” he says after the first movement of the Schubert. “Could I be physically removed from my apartment?” By a SWAT team? He still doesn’t have a lawyer- he is handling everything himself. He has been here for nearly 10 years- in the second courtyard, side building. He came here from New York because of his childhood heroes, as he describes them. He wanted to live in the homeland of Beethoven. In the homeland of Schumann and Brahms. He wanted to be nearer to them. As a child, he explains, at age eight he would “escape reality into the world of music.” One time a female neighbor swore frighteningly at him because he practiced so much. Another time teenagers threw eggs at him. He didn’t even know them. He was different– a childlike hermit, perhaps, obsessed with Beethoven. Things didn’t change when his family moved from Santa Monica, California to Washington, DC. His parents, both scientists, had come from Iran. The door to the property management’s office opens just a crack. The bosses unfortunately aren’t here, appointments elsewhere, the woman whispers. “I wrote you but you don’t answer!” Soheil Nasseri says. “You sent me an eviction notice!” The woman closes the door. Mr. Nasseri rings the doorbell again. This time a man opens – he, too, is wearing glasses. In the gloom of the hallway he looks a bit like East German Stasi captain Gerd Wiesler, who Ulrich Mühe played so brilliantly in The Lives of Others. “You will leave the building immediately,” says the voice of this Wiesler, here in Berlin’s Uhlandstrasse, where an anonymous building owner decided to throw a pianist out of his apartment. “You will not be ringing the doorbell any more. Do we understand each other?” The door closes and locks shut. Behind the door a dog barks. Soheil Nasseri goes slowly back down the stairs. What did a woman write him on Facebook? “I would give anything to have you as a neighbor.” He smiles. From here it is not far to his church, the sleeping hall. He will practice another two hours. Beethoven is waiting.